On 1 March 1981 a hunger strike organised by paramilitary republican prisoners got underway at the Maze (Long Kesh) H-blocks prison in Northern Ireland as part of the prisoners’ ongoing campaign to obtain political prisoner status and its accompanying privileges. The strike was initiated by Gerard (‘Bobby’) Sands and ten strikers died before the strike was called off on 3 October. 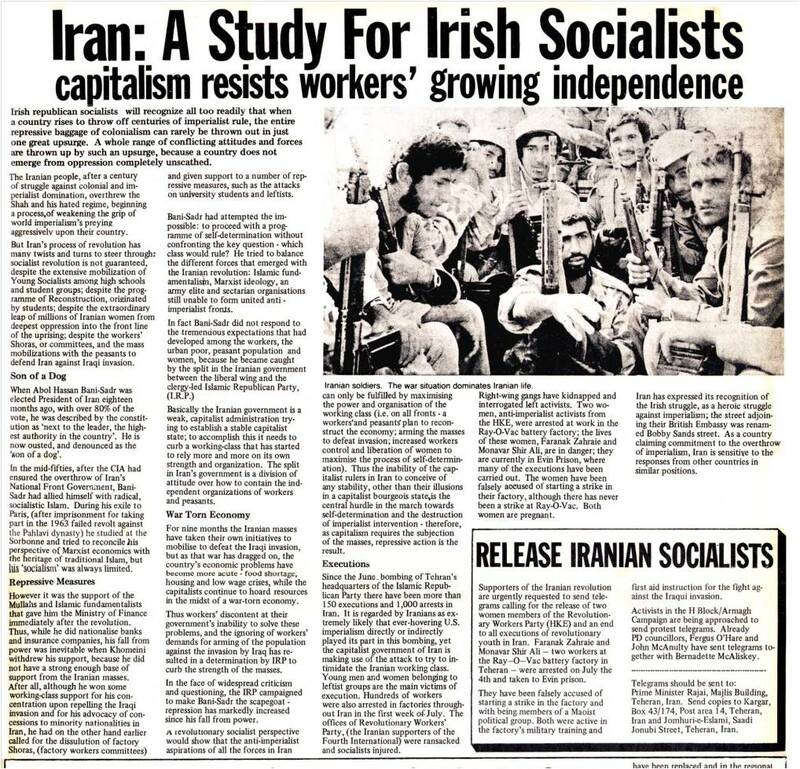 The recently established Islamic Republic of Iran (founded on 1 April 1979) engaged in extensive propaganda campaign in support of the Irish republican hunger strikers under the banner of solidarity with anti-imperialist struggles and the downtrodden peoples around the world. 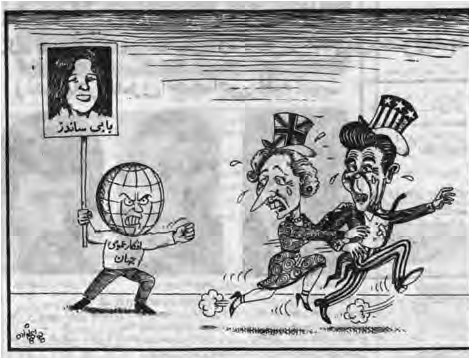 This was an additional opportunity for the Islamic Republic of Iran (IRI) to condemn what it cast as British imperialism and its brutality, by appropriating and reframing the Irish republican struggle. An Iranian cartoon appearing after Bobby Sands’s death on 5 May. The globe-headed figure, holding a placard with the picture of Sands, sports a shirt bearing the phrase ‘world public opinion’. Kayhān, 17 Ordibehesht 1360 (7 May 1981), 12. Britain and the US had a long-standing legacy of imperialist aggression in Iran, with both powers at the time supporting Saddam Hussein in the Iran-Iraq War (22 September 1980-20 August 1988). 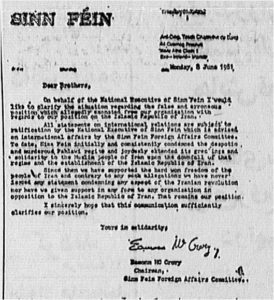 In its ‘Hunger Strike’ propaganda campaign, IRI grafted its own leading foreign nemesis (the US) to the primary target of the Irish republican struggle, which was the British state. 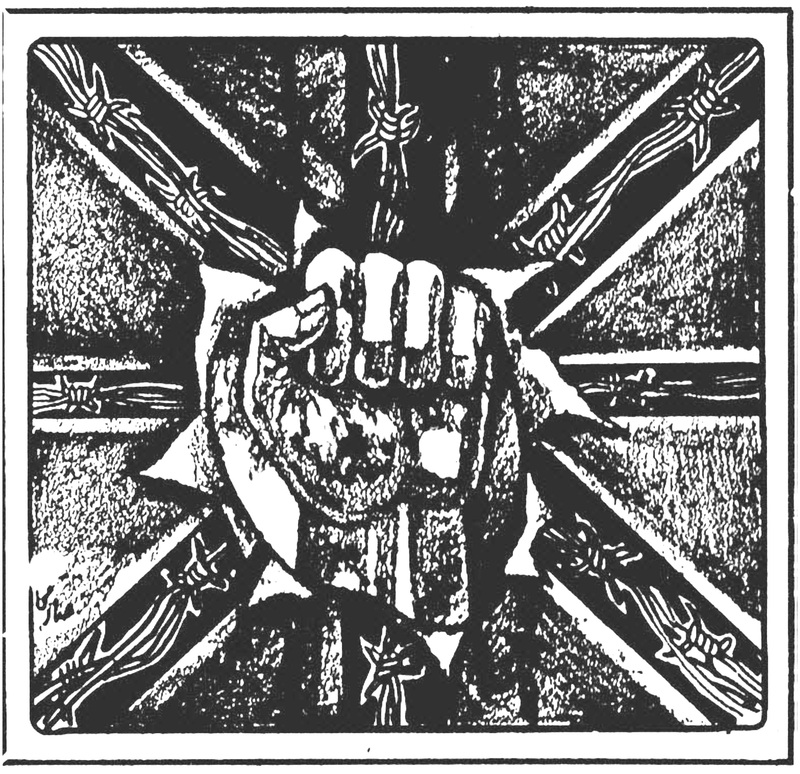 The British Union Jack with barbed wire crosses, symbolising British occupation of Ulster, with the fist of the republican nationalist masses in revolt tearing through the flag. Ettelā’āt, 20 Ordibehesht 1360 (10 May 1981), 16. IRI was by no means a pioneer in Iranian expressions of solidarity with the armed republican movement in Northern Ireland. Various Iranian secular (primarily leftist) and religious groups that had participated in the Iranian Revolution of 1978-1979 and were now opposed to IRI were already advocates of the armed republican struggle in Northern Ireland and sympathised with the Irish hunger strikers. 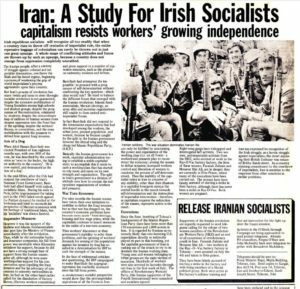 These Iranian dissident groups and IRI overwhelmingly ignored, or outright dismissed, the most popular Irish nationalist and Catholic civil rights organisation in Northern Ireland at the time: the parliamentary Social Democratic and Labour Party led by John Hume, which constituted the largest pro-republican organisation and eschewed violence. The broad-based Iranian fixation on armed struggle was largely a symptom of Iran’s own pre- and post-revolutionary violent politics. All Iranian groups (pro- or anti-IRI) that supported the Irish republican armed struggle presented the Northern Ireland conflict in an abstracted and absolutist form, which also included the Third-Worlding of Northern Ireland. In this oversimplified narrative of the period known as ‘the Troubles’ in Northern Ireland (1969-1998), Ulster (the six counties comprising Northern Ireland) was itself cast as a form of prison, with the so-called genuinely Irish population, uniformly characterised as republican (often also as uniformly Catholic), in revolt against the brutal British imperialist occupation of the territory, with no historical, political, or social nuance. In my late teens at the time, I, too, viewed the Troubles through a narrow and bifurcating lens of ruthless British imperialism versus legitimate republican armed insurgency. There is an interesting historical background to Irish-Iranian anti-imperialist engagements prior to 1981, most of which has not been previously interrogated, and what has so far been explored remains little known outside highly-specialised scholarly circles. I cover much of this history in the monograph I am completing, tentatively titled Éirinn & Iran go Brách: Iran in Irish-nationalist historical, literary, cultural, and political imaginations from the late 18th century to 1921. The most extensive and prolonged Irish nationalist expressions of solidarity with the Iranian ‘nation’ occurred during the Iranian Constitutional Revolution of 1906-1911. For their part, Iranian anti-imperialists only engaged in public advocacy of the Irish nationalist struggle (primarily the republican camps) following the 1916 Easter Rising in Ireland. Following the creation of the Irish Free State in 1922 — later known as Éire (1937) and the Republic of Ireland (1949) —, there was sporadic advocacy of the republican struggle in Northern Ireland by various Iranian anti-imperialist factions; most extensively during the Troubles, which erupted in 1969. 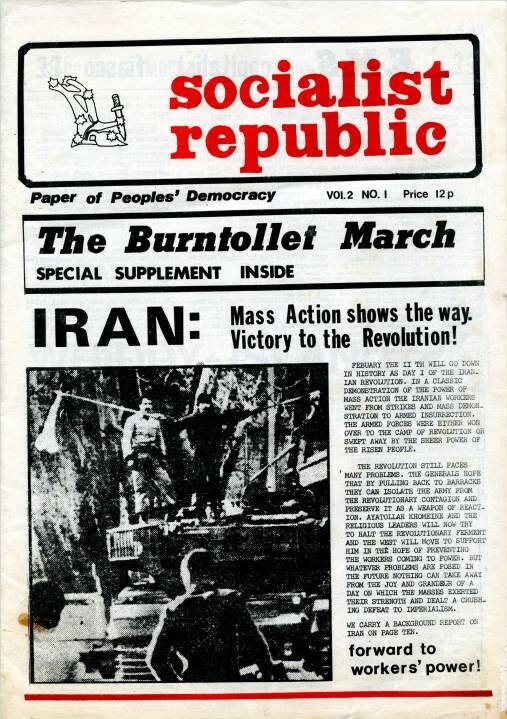 Front page of an undated February 1979 issue (after 11 February 1979) of the publication of People’s Democracy Socialist Republic (Belfast and Dublin), vol.2, no.1. 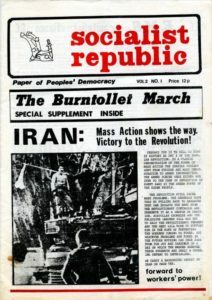 Various Irish nationalist organisations in the Republic of Ireland and in Ulster expressed solidarity with the mass Iranian uprising of 1978-1979 that overthrew the Iranian monarchy. In Northern Ireland, these included the Provisional Irish Republican Army (PIRA) and its political wing, the Provisional Sinn Féin (PSF), founded in 1969 — PIRA constituting the largest republican paramilitary organisation in Northern Ireland and accounting for the largest proportion of republican paramilitary prisoners and the largest number of prisoners joining the 1981 hungerstrike —, the Irish National Liberation Army (INLA) and its political wing, the Irish Republican Socialist Party (IRSP), founded in 1974 — whose imprisoned members also joined the 1981 hunger strike —, and such groups as the ‘non-violent’ revolutionary republican socialist (gradually Trotskyite) People’s Democracy, founded in 1968. During the 1981 hunger strike, there was a clear split in the public posturing of various Irish nationalist groups toward the Islamic Republic of Iran, which was enthusiastically endorsing the hunger strike. Whereas PIRA/PSF, the principal beneficiary of IRI’s propaganda campaign, remained silent on the repressive domestic policies of the Islamic government, most other republican groups in both Ulster and in the Republic of Ireland vehemently condemned IRI. 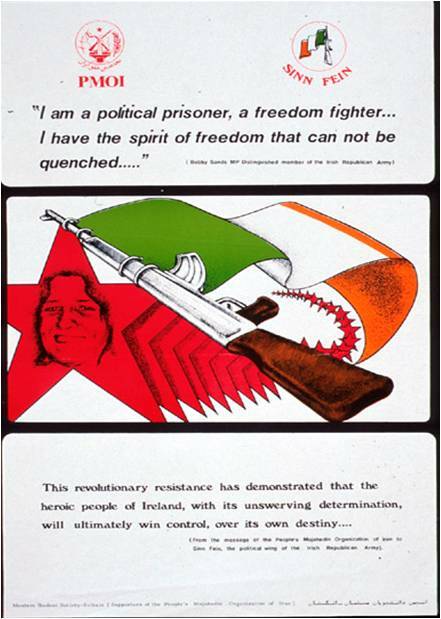 Socialist Republic (Belfast), vol.4, no.7, August 1981, 11. By 1982, IRSP/INLA would go so far as championing an Iranian opposition group then in exile, the (Islamist) Mojahedin Khalq, which was fast metamorphosing into an authoritarian political cult of personality. 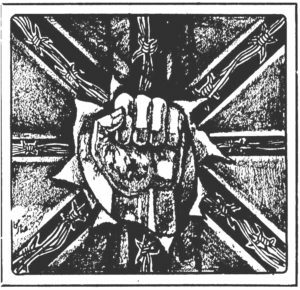 The IRSP publication The Starry Plough, April 1982, 4. 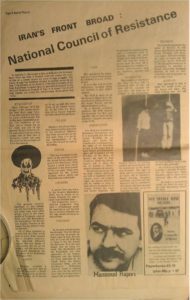 Coverage of the death of the second hunger striker Francis Hughes (on 12 May 1981) in the publication of the (Marxist-Leninist) Organisation of Iranian Peoples’ Feda’i Guerrillas, Minority faction. Kār, 3, 110, 30 Ordibehesht 1360 (20 May 1981), 11. During the 1981 hunger strike many competing Iranian dissident organisations, as well as IRI, which these dissidents opposed, simultaneously avowed solidarity with the largest republican paramilitary faction in Northern Ireland, PIRA, and its political wing, PSF — with some Iranian dissident groups also expressing solidarity with INLA/IRSP. The hunger strike at the Maze prison became a contested terrain of competing claims of ideological and existential affinity by rival Iranian political camps in what was Iran’s own internecine post-revolutionary Troubles. The Iranian state had the upper hand in terms of propaganda publicity, ranging from national TV and radio stations to the state-controlled press and other venues, as in the case of nation-wide Friday prayers at mosques, official posters, and so on. It also had the advantage of diplomatic appeal when courting PIRA/PSF, with IRI sending a number of delegations to Northern Ireland. Another example was IRI’s renaming of a street adjoining the British embassy compound in Tehran the ‘Bobby Sands Street’ following Sands’s death on 5 May 1981 after 66 days on hunger strike. Reproduced in Troubled Images. Posters and images of the Northern Ireland conflict from the Linen Hall Library, Belfast. CD-ROM (Belfast, 2001), image PA0029a. 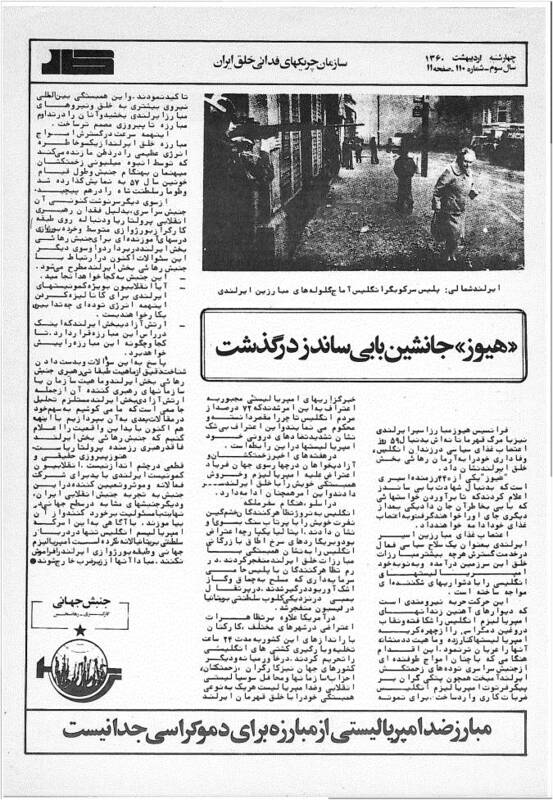 Among other such examples, IRI authorities circulated a folded leaflet on ‘Irish People’s Struggle from the Viewpoint of the Islamic Republic of Iran’, published by the Foreign Relations Section of the College of Martyr Mottahari (Tehran). 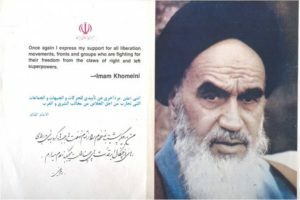 The pamphlet included a segment of a Friday prayer sermon given in Tehran on 8 May 1981 by the cleric Ali Khamene’i on the subject of Sands’s resolve and death. Khamene’i was then the Friday prayer leader of Tehran and the proprietor of Jomhouri-e Eslāmi newspaper, which was a leading propaganda mouthpiece of the regime in the coverage of the hunger strike. He later served as president and is the current [supreme] leader of the Islamic Republic of Iran (since 1989). The front side of this leaflet carried a photograph of the founder and spiritual leader of IRI, Ayatollah Khomeini, along with a statement by Khomeini in support of liberation struggles against Western and Communist superpowers (appearing in English, Arabic, and Persian). PIRA/PSF was appreciative of, and reciprocated, IRI’s gestures of solidarity, while generally seeking to avoid overt partisanship in Iran’s internal politics. Report of the official Iranian acclamation of Sands in the PIRA/PSF publication An Phoblacht/Republican News (9 May 1981, 5, 13, 16.) The report of Sand’s funeral compared the crowd at the funeral and the crowds during the Iranian Revolution of 1978-1979. 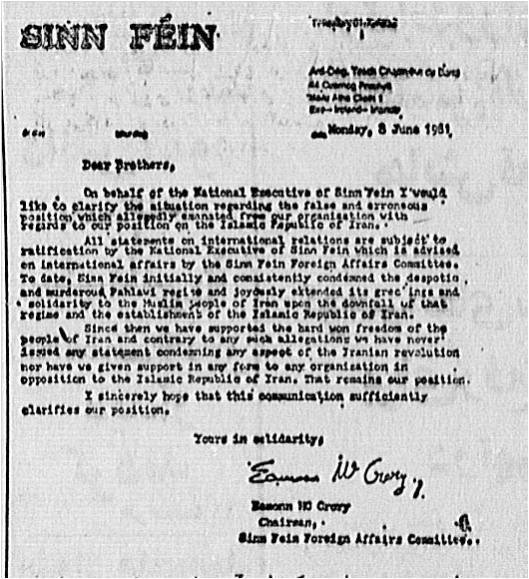 The paper referred to Sands as ‘the republican martyr.’ The Irish republican hunger strikers were also labeled ‘martyrs’ by IRI and many Iranian dissident organisations). The Iranian representative who arrived in Belfast shortly after the funeral was the attaché in London., Seyfollah Ehda’i. An 8 June 1981 PSF communique to the Iranian government, signed by the PSF director of international affairs Eamon McCrory, reproduced in the Iranian newspaper Ettelā’āt, (4 Tir 1360 [25 June 1981], 2). Given IRI’s brutal suppression of internal dissident groups and its extensive propaganda investment in the 1981 hunger strike, IRI sought to deny any validity to Iranian dissident organisations’ claims of sympathy and solidarity with the Irish hunger strikers. 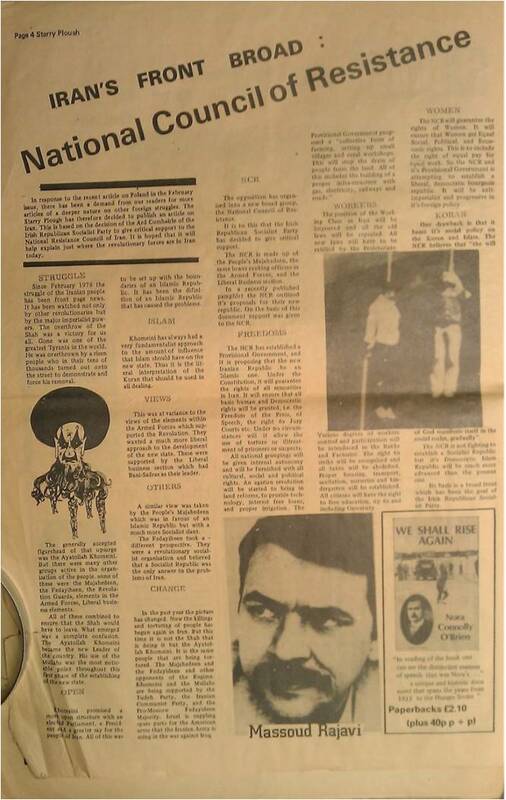 To this end, IRI also repeatedly publicised the communiques it received from PSF. Under pressure from IRI, in June 1981 PSF denied supporting Iranian groups opposed to IRI. 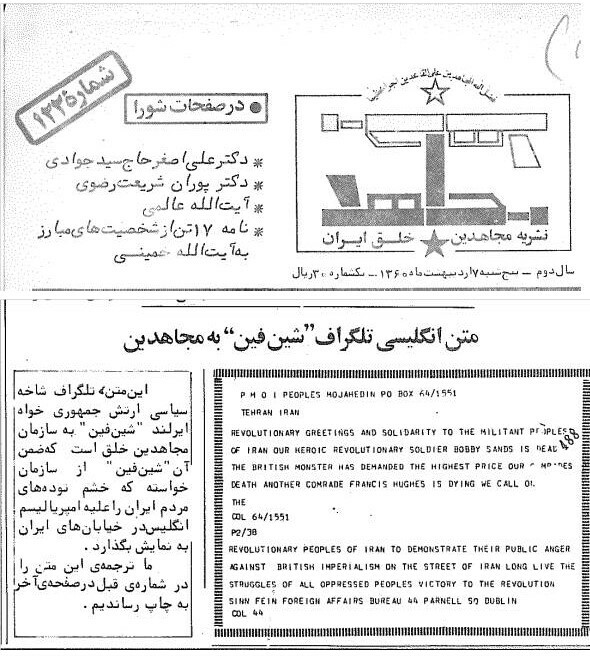 A number of Iranian dissident organisations that had participated in the 1978-1979 Revolution and now opposed IRI had already established contacts with PSF, among other worldwide groups. One particular Iranian dissident organisation during the hunger strike that routinely claimed continued PIRA/PSF solidarity with its stance against IRI was the (then Marxist-influenced) Islamist group Mojahedin Khalq. 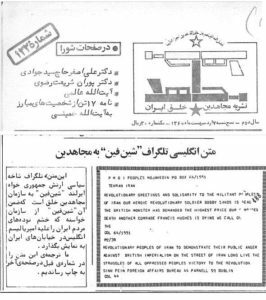 Copy of a telegraph sent by PSF to Mojahedin Khalq, among other worldwide organisations following Sands’s death, urging public display of ‘anger against British Imperialism’. Mojāhed, 122, 17 Ordibehesht 1360 (7 May 1981), 6. Whereas early in the hunger strike PSF had maintained its contacts with Mojahedin Khalq, these contacts were terminated by PSF during the remainder of the hunger strike to avoid offending IRI authorities. Mojahedin Khalq, nonetheless, claimed continued cross-solidarity with PSF. An example of Mojahedin Khalq’s self-identification with PIRA/PSF. Also reproduced in Troubled Images. Posters and images of the Northern Ireland conflict from the Linen Hall Library, Belfast. CD-ROM (Belfast, 2001), image PPO1417. Just as in Irish nationalist tradition, in Iranian religious and secular political discourses, too, there were alternative constructs of ‘Martyrdom’, which were now applied to Irish hunger strikers; most prominently in the propaganda campaign of IRI, in which the hunger strikers were frequently also likened to Iranian forces fighting in the Iran-Iraq War. The Irish hunger strikers became the first non-Muslim non-Iranians to be officially designated ‘martyrs’ by IRI. 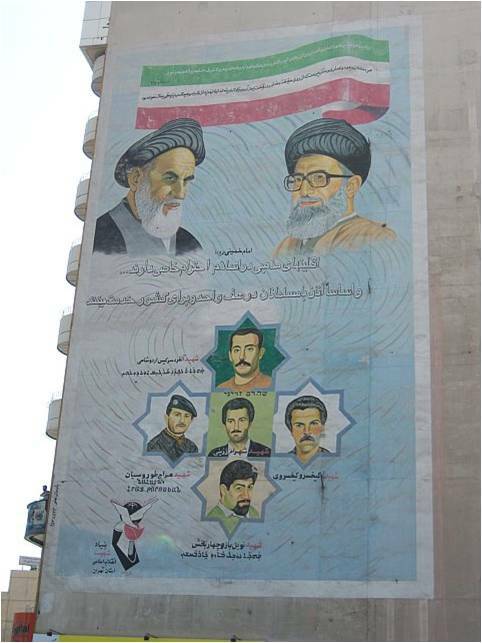 A mural in Tehran (photo taken in 2007) celebrating the heroic ‘martyrdom’ of Iranian soldiers killed in the Iran-Iraq War belonging to officially-recognised non-Muslim religious minority groups. The soldiers represent the Armenian Christian, Assyrian (Nestorian) and Chaldean Christian, Jewish, and Zoroastrian communities. 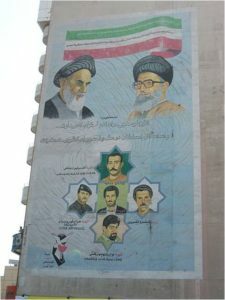 I am unaware of any official murals in Tehran related to the 1981 hunger strike. Among numerous poems dedicated to the hunger strikers in the pro-IRI press, a poem appearing in IRI’s official mouthpiece Kayhān (13 July [22 Tir 1360], 12) was jointly dedicated to Sands and Mohammad Hussein Fahmideh, a thirteen-year-old Iranian volunteer fighter (basiji) who had blown himself up under an Iraqi tank on 30 October 1980. 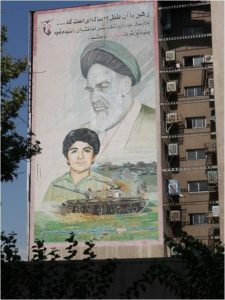 Fahmideh was praised by Ayatollah Khomeini as an extraordinarily heroic martyr. 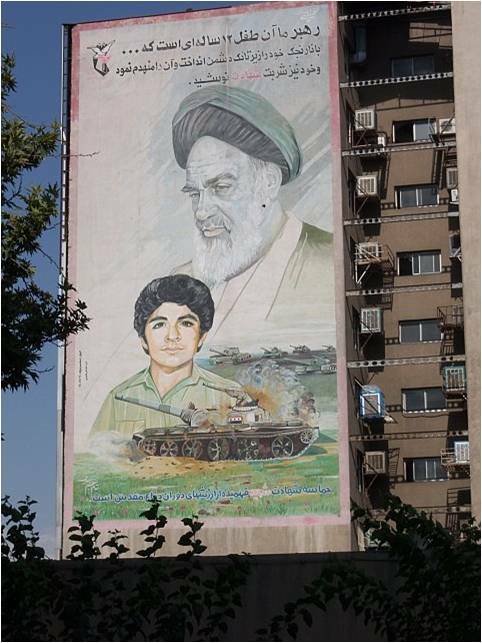 A mural, in Tehran honoring Fahmideh bears the statement by Ayatollah Khomeini: ‘our leader is that 12-year old [sic] child … who, [holding] a hand-grenade, threw himself under the enemy tank and destroyed it while himself tasting the nectar of martyrdom’. To this day IRI and Iranian social activists and political dissidents still selectively evoke the memory of the 1981 Irish hunger strikers in their competing claims of self-identification with the suffering of those hunger strikers. An example is that of a poster in support of the jailed non-violent Iranian social and political activist Arash Sadeghi, who was on hunger strike for 71 days in 2016-2017 before his eventual release. 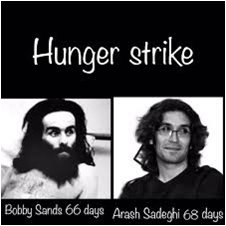 The poster included a photo of Sadeghi alongside the famous gaunt photo of the 1980 Irish republican hunger striker Raymond MacCartney, mistakenly identified as Bobby Sands. With the English text indicating that Sadeghi’s hunger strike had surpassed the duration of Sands’s strike, this poster was also clearly aimed at the well-known continued public acclamation of Sands’s heroism by the current [supreme] leader of IRI, Ali Khamene’i. Mansour Bonakdarian (PhD, University of Iowa) specialises in British, imperial, and Middle Eastern history. He is currently completing a monograph titled Éirinn & Iran go Brách: Iran in Irish-nationalist historical, literary, cultural, and political imaginations from the late 18th century to 1921. His article “Iranian Consecration of Irish Nationalist ‘Martyrs’: The Islamic Republic of Iran and the 1981 Republican Prisoners’ Hunger Strike in Northern Ireland” will appear in Social History 43(3), Summer 2018. M. Bonakdarian, Britain and the Iranian Constitutional Revolution of 1906-1911: Foreign Policy, Imperialism, and Dissent (Syracuse, 2006); M. Bonakdarian, ‘Erin and Iran Resurgent: Ireland and the Iranian Constitutional Revolution of 1906-1911’ in H.E. Chehabi and V. Martin, eds., Iran’s Constitutional Revolution: Politics, Cultural Transformations, and Transnational Connections (London, 2010), 291-318. M. Bonakdarian, ‘The Easter Rising as a Milestone in Iranian Nationalist Appraisals of the Irish Question’, American Journal of Irish Studies 14 (2017), 60-72. Dáil Debates, vol.135, no.2, 1952, c.255. This entry was posted in Uncategorised on 24th May 2018 by Grainne Goodwin.